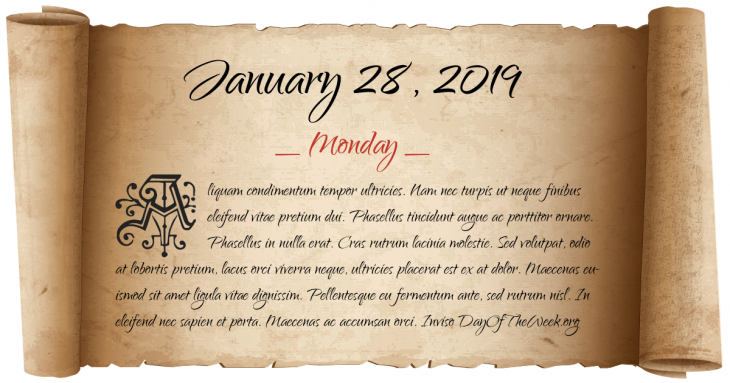 What Day Of The Week Was January 28? An act of the U.S. Congress creates the United States Coast Guard. The World Land Speed Record on a public road is broken by driver Rudolf Caracciola in the Mercedes-Benz W195 at a speed of 432.7 km/h. World War II: Supplies begin to reach the Republic of China over the newly reopened Burma Road. The first day of the Great Lakes Blizzard of 1977, which severely affects and cripples much of Upstate New York, but Buffalo, NY, Syracuse, NY, Watertown, NY, and surrounding areas are most affected, each area accumulating close to 10 ft of snow on this one day. Space Shuttle program: STS-51-L mission – Space Shuttle Challenger breaks apart after liftoff killing all seven astronauts on board. New Year’s Day in Chinese calendar. Start of the year of the Earth Tiger in Chinese astrology. Five murderers of President Sheikh Mujibur Rahman of Bangladesh: Lieutenant Colonel Syed Faruq Rahman, Lieutenant Colonel Sultan Shahriar Rashid Khan, Major AKM Mohiuddin Ahmed, Major Bazlul Huda and Lieutenant Colonel Mohiuddin Ahmed are hanged. Who were born on January 28?